Prevent Dryer Vent Fires with annual dryer vent cleanings and safety nspection from one of our C-DET Certified dryer vent & Exhaust Technicians. Having the dryer vent cleaned not only helps to prevent dryer vent fires, it will also extend the life of your appliance. In addition to having a dryer vent fire, excess lint & debris build up in your dryer vent can cause the appliance to exhert itself by working overtime and potentially cause hazardous conditions including dangerous levels of carbon monoxide in your home. 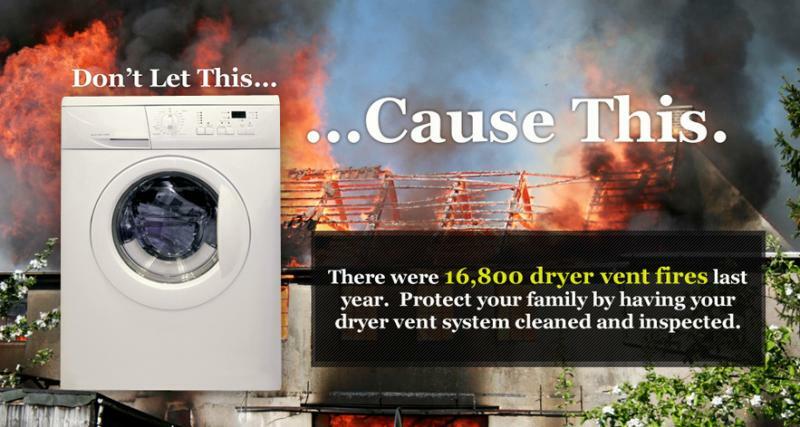 So what are some of the warning signs you may be in need of a dryer vent cleaning or safety evaluation? In some case the dryer takes longer than the agerage 30 minutes to dry one load of clothes or the dryer may burn out the heating elements. You may be experiencing a lack of air flow from the vent or it may appear to be clogged. It is also recommended to have your dryer vent evaluated when purchasing a new home or selling your home. This will eliminate any doubt of the appliance being up to current code standards.